The chisel is limited to the degree it can smooth surfaces uniformly and regularly. Though the chisel can and often is used to scrape hard-to-reach areas of the surface smooth, more efficient means of refining contours and smoothing the surfaces of a carving are common Rasps, Files, the specially-shaped versions of both - called Rifflers - and Abrasives. Softer stones are most quickly worked with Rasps and Files. 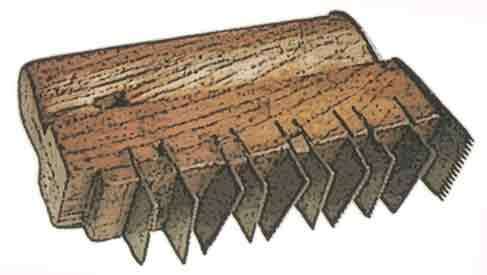 Like all Rasps, the round 'rat-tail' Rasp above (shown in profile and cross-section) has numerous individual sharply pointed teeth arranged in rows on the surface of the tool. The teeth of the Rasp allow it to cut and remove material relatively quickly, though leaving distinct scratches across the surface being worked. The round 'rat-tail' File has rows of 'teeth' which are broad, flat cutting edges rather than individual pointed teeth. The teeth of the File allow it to cut the material fairly smoothly, thus leaving less scratches on the work surface than a Rasp, though the cutting action is slower and material is not removed as quickly. The overall shape of the rat-tail Rasp or File makes it an ideal choice for smoothing contours that are concave in one dimension and flat or convex in the other, such as a hole in a torus (doughnut). The 4-In-Hand File has both rasp and double cut file teeth in flat and half-round surfaces, making it a versatile tool. The Half-Round Rasp (above) and the Half-Round File (above) both have a flat side and a curved side that allows them to be used on either flat or curved surfaces. 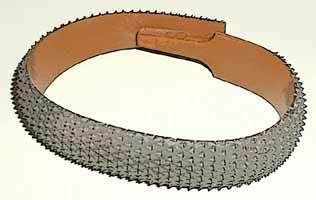 The double-ended Riffler Rasp usually has a different shape at either end, each different shape allowing work in hard-to-reach areas of the carving. The two pictured at right are typical, and perhaps some of the more useful Riffler shapes. The examples shown are old tools from France. In use they are scraped and dragged across the surface to make it more uniform. The tools pictured below are specific to working soft limestones. One of the English names used to refer to these wooden-handled tools was Cockscombs. One of the modern French stone tool suppliers (Joseph et Fils, Paris) still stocks tools made in these traditional designs. Basically it is a half-round 8"
On softer stones and marble, solid tungsten carbide Rotary Rasps, Files or Burs are used in a power tool to shape hard-to-reach areas much more quickly than hand tools allow. 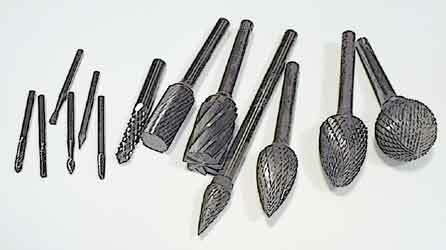 The examples shown are just a few of the wide variety of shapes available in 1/4" and 1/8" diameter shanks.